Including Intel Core i7 technology, the new B&R Panel PC 900 with multi-touch functionality offers a high level of computing power. The device uses an edge-to-edge, anti-glare glass surface and high-resolution monitors. Displays range from 15.6" to 24" with Full HD resolution. The multi-touch displays allow new user interactions, such as zooming with two fingers or quickly paging forward with swipe gestures. In addition, two-hand gestures for critical or potentially dangerous operations provide an effective way of preventing unintentional operator errors. Systems in the panel PC series are available as widescreen displays in addition to the traditional 4:3 format. 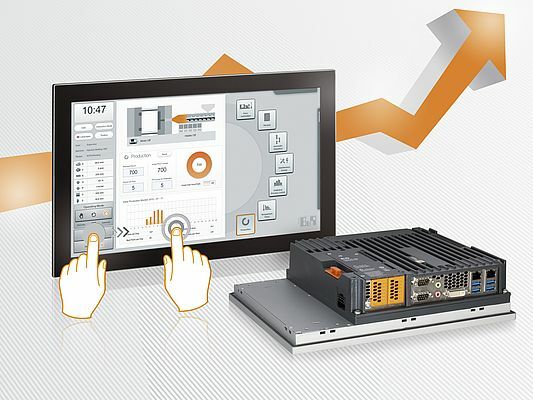 Equipped with an analog resistive touch screen and display sizes ranging from 12.1" to 19", the panel PC single-touch systems provide full compatibility with the previous device generation with respect to screen resolution and dimensions. Many panel PC variants can be operated without fans. Used together with SSD drives and/or CFast cards, these systems completely eliminate rotating components, making maintenance work such as regularly replacing the air filter a thing of the past. with modular display units from 10.4" to 19"